Every time we look at the fabulous work that the Carlson's captured of our wedding day, it takes us back to each moment of our special day. They were fantastic to work with, the time and patience they had with our wedding party, was truly appreciated. We can't even imagine anything more special than the images that were captured, from the first look where my now husband saw me in my wedding gown, with the crystal blue waters of bay, to the time spent at a close family friends cherry orchard, to historic Fishtown and back to Northport where our vows were spoken and our reception was held. The candid shots of our family and guests are captured to share for years to come. 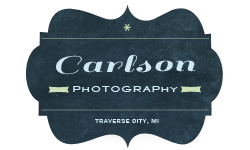 We will cherish each and every one of the amazing memories that Carlson Photography captured. We truly can't thank them enough!